DEDICATED TO CUSTOMER SERVICE AND STANDING BEH IND EVERYTHING WE DELIVER. We’re a local Lancaster, New York flower shop that has been family-owned and operated since 1987 and offers a wonderful variety of fresh flowers, plants and custom gift baskets for all occasions. We hope you enjoy your online shopping experience with secure 24-hour ordering right at your fingertips. If preferred, you may call us to place orders direct at (716) 683-1001. It is our pleasure to assist you with any local, as well as worldwide deliveries and remember that corporate accounts are always welcome. For your convenience, we offer daily floral delivery to all local funeral homes and hospitals. We are OPEN to serve your floral & gift needs: Monday through Friday 9:00 am to 5:30pm and Saturday 9:00 am to 3:00 pm. When you can't be there to bring a cake, we will deliver a fresh 8" decorated birthday cake! 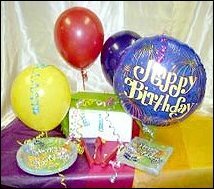 We also include plates, napkins and plastic utensils all delivered in a plastic bag topped off with balloons. (Please allow 24-hours notice.) We also suggest our festive gift bag filled with a plush bear and a 1 lb. box of quality mixed chocolates and topped off with colorful balloons. You can depend on the courteous staff at Petals to Please when you need flowers for the funeral of a friend or loved one. We can create a funeral arrangement that will serve as a lovely tribute and conveys your feelings of sympathy. Browse our wonderful dish gardens and green & blooming plant selection for a gift that adds life to any room or office. 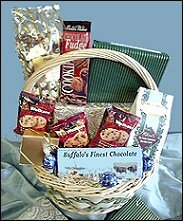 We offer an array of gift ideas for any age or occasion, including custom gift baskets, fruit & gourmet baskets, candy & chocolates, home décor, silk flowers, stuffed animals, balloons and more! Let us help you plan the flowers and on-site decorations for all your special events. Is your wedding or party formal or casual? A small gathering or the social event of the year? Call us in advance to schedule your consultation. Thank you for visiting our website at your convenience, 24 hours a day for flowers delivered fresh from a local Lancaster, NY florist!